Greetings, holiday movie fans and culture lovers, I am the Great Gonzo...or, as I am better known to fans of this classic motion picture -- literary legend Charles Dickens. Ready to laugh, cry, sing, frolic, cavort and enjoy yourself beyond belief!? 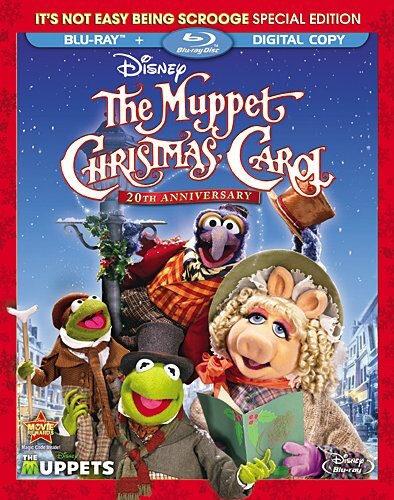 Well, you're in luck, because this 20th Anniversary Edition of Disney's THE MUPPET CHRISTMAS CAROL is guaranteed to put you in a holiday spirit that will stay with you forever -- or at least until your Aunt Ruth starts complaining that nobody is eating the fruitcake she brought...again! Available on Blu-ray with high definition sound and picture, so you can enjoy even more of my blue-ness, not to mention the incredible spectacle of Kermit the Frog as Bob Cratchit, Miss Piggy as Emily Cratchit, Academy Award(R) winner Michael Caine (Best Supporting Actor, 1999, THE CIDER HOUSE RULES) as Scrooge, wonderful songs by Academy Award winner Paul Williams (Best original Song, 1976, "Evergreen," from A STAR IS BORN), and, of course, my pal Rizzo the Rat as...well, Rizzo the Rat. A heartwarming and hilarious holiday classic, told as never before by yours truly! Yule love it! Happy Holidays!